Dr. Gomoll is an Orthopaedic Surgeon at the Hospital for Special Surgery in New York, and an Associate Professor of Orthopedic Surgery at Cornell Medical School. Born and raised in Munich, Germany, he received his medical degree from Ludwig-Maximilians-University Munich, with additional training in Orthopaedic and Trauma Surgery in Cape Town, South Africa, and Oxford, UK. Dr. Gomoll completed a post-doctoral research fellowship at Brigham and Women’s Hospital, Boston, before joining the Harvard Combined Orthopaedic Residency Program at Massachusetts General Hospital, Boston. He subsequently completed a Fellowship in Orthopaedic Sports Medicine at Rush University. 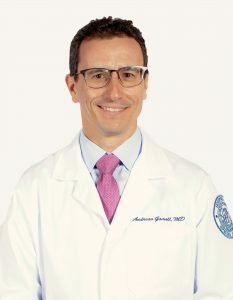 After fellowship he joined the Cartilage Repair Center and Department of Orthopaedic Surgery at Brigham and Women’s Hospital, where he rose to Associate Professor of Orthopaedic Surgery at Harvard Medical School, and Director of the Orthopedic Program of the BWH Center for Regenerative Medicine. He moved his practice to the Hospital for Special Surgery in 2018. Dr. Gomoll specializes in biologic joint reconstruction and joint preservation through cartilage and meniscus transplantation, a topic that he has lectured and published extensively on. His main clinical and research interest lies in emerging technologies for joint preservation, most recently investigating the use of stem cells both in the lab and through randomized clinical trials.